I have always been a collector of old frames. Large, small, ornate or simple, it doesn't matter. I love them. But what to do with them once you've collected a few (okay, more than a few)? I created a grouping in my hallway using the frames and old photos. 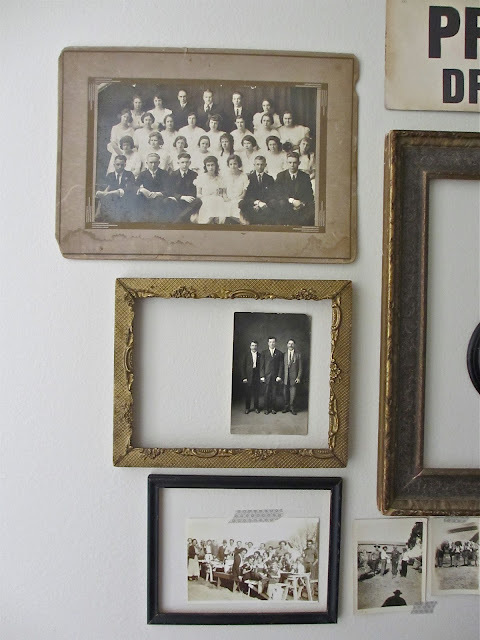 Most of mine are family photos but if you don't have access to such photos there are 1000's for sale in antique shops, junk stores, as well as Esty and Ebay that can be used. Once you have everything gathered together, measure the wall space the frames will take up. Layout your frames on the floor or a nearby bed to get a visual of how you want the wall to look (keep inside your measurements). I only worked with the frames during this stage...no pictures yet. Add nails to the wall to hang the frames using the small level to keep things straight. Once the frames were in place, I started adding the larger photos with squares of Command adhesive (or another adhesive that will not damage your photos). I found the "Private Driveway" paper sign at my local antique store, Ruby Rose awhile back...it fit perfectly here. The oval frame with the beautiful convex glass was a gift from my friend Sande. She purchased it while we were in Paris together in 2012 (a gracious gesture to say the least). I added my favorite little photo booth pic of my mom then hung it with a bit of vintage ribbon to take up more the the space inside the large frame. 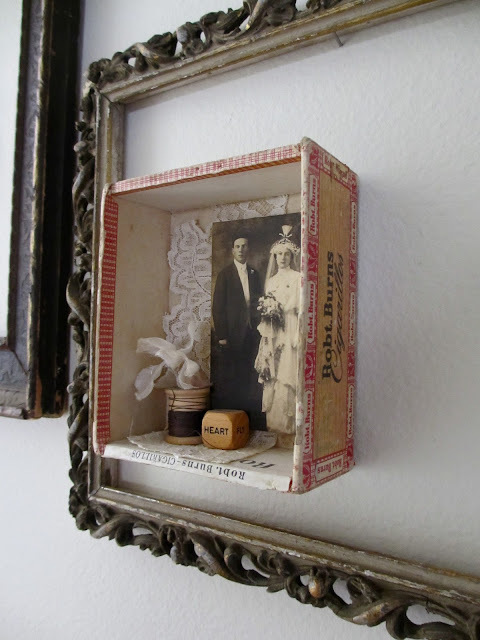 Moving down the hallway, I added a simple shadowbox I created for a past CHA show booth display made from a small cigar box. It has my maternal grandparents wedding photo taken December 2, 1914. Again, I just stuck the shadowbox to the wall with Command Adhesive. 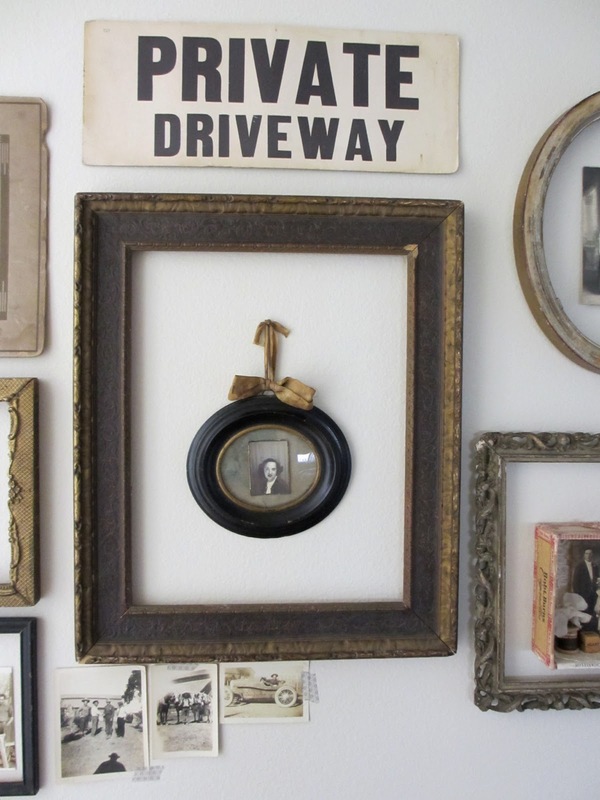 The oval frame at the top is a beautiful antiqued gold color. However, as I was putting it up I noticed the old paper that had once covered the entire back. I decided that much much more interesting, so it now hangs backwards on the wall. 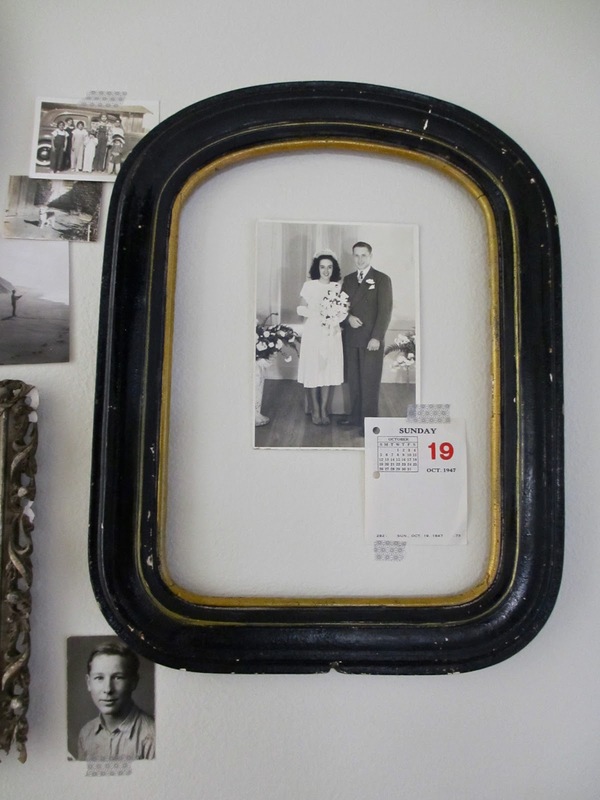 And the last section, a large black frame with my parents wedding photo. The inside edge was a weird peach color so I painted it with Tarnished Brass Distress paint. 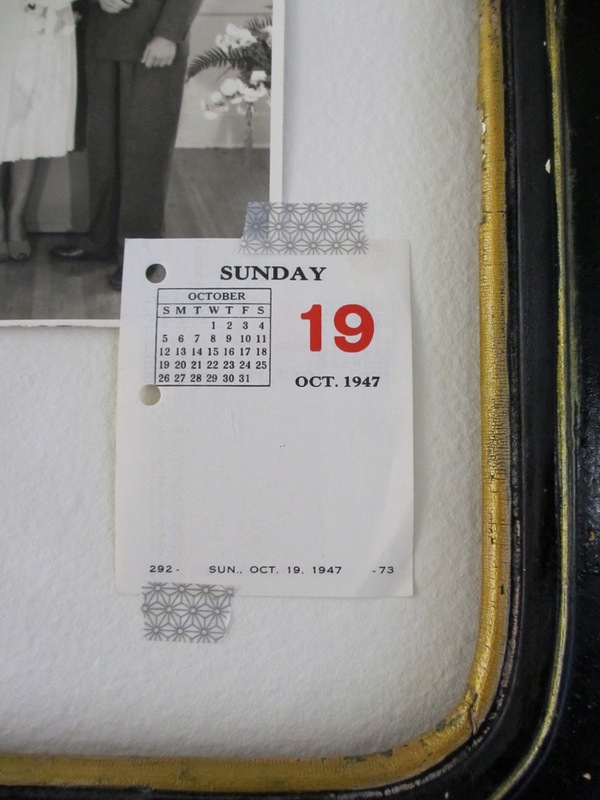 A piece of ephemera taped below is a vintage calender page with their wedding date. The last layer is the small photos that you see taped to the wall with Washi tape. 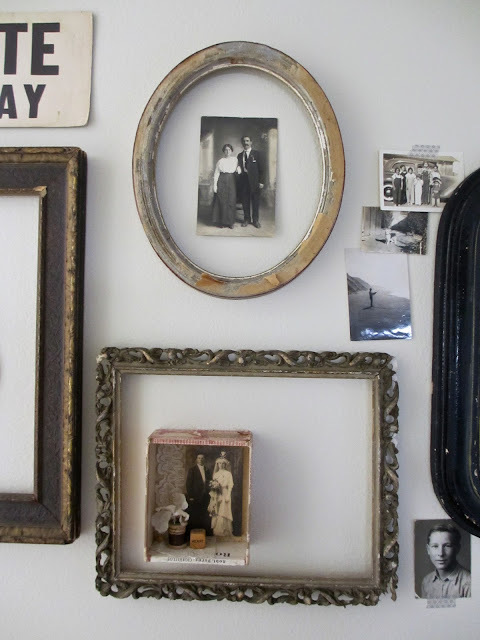 A super easy way to make the wall appear unplanned and haphazard which is what I like. I can add more frames and more pictures in the future if I so choose or take it all done in a matter of minutes. I think the biggest mistake people make in decorating is never doing anything because they're afraid. Decorating should be fun and make you feel like you really "live" in your house. Don't worry about nail holes...they can always be filled later! 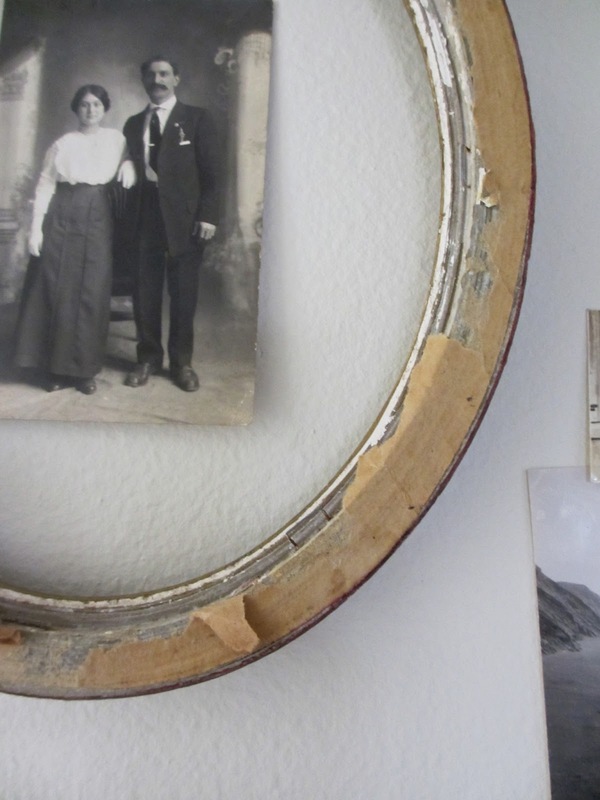 Don't let fear stop you from being creative, because really, what good is a box of old family photos if you just leave them sitting on the shelf? And if your afraid of damaging the photos... just a make a color copy (even if it is a black and white photo). What a wonderful collection. I love the randomness of it all. Paula at Paula's best! Love this arrangement Paula!! So inspiring!!! Thank you for sharing it! I love the texture and depth you achieved with this project. I'd love to see your whole house. I know it is just stunning. . I have a similar set-up of family pictures on one of my dining room walls. It's the "family schtuff" room. My Great-Aunts dining table and chairs, my Great-grandfathers hope chest, hubbys grandparents china hutch, my Grandmothers side table that sat in her entryway and now is in mine along with old family pics in frames. It's my way of keeping our family history alive. I love the eclectic look of all the different frames. Looks wonderful! I love and collect old frames too, but you've really shown me how to think outside the box... er, frame!! What a fabulous grouping. You're amazing! This photo layout is so very cool-love your creativity Paula!! This is fantastic... I love how many things are in the frames but not the traditional way.